Based on online purchase for December 2018. Prices may vary throughout the season. Skiing in Deer Valley began in the 1930s, with the Park City Winter Carnivals, and gained increasingly popular when the Works Progress Administration built the first ski trails along with other facilities in 1936. The first ski lifts appeared in 1946, in the area that was called Snow Park Ski Area at the time. In 1981, Edgar Stern founded the Deer Valley Resort in the same area, which today includes six mountains, Little Baldy Peak (7,950ft), Bald Eagle Mountain (8,400ft), Bald Mountain (9,400ft), Flagstaff Mountain (9,100ft), Empire (9,570ft), and Lady Morgan (9,000ft), with 670 acres of snowmaking and 930 acres of glade skiing totaling a massive 2,026 acres. The Deer Valley Ski Resort is one of the first to offer ski valets to their guests to carry ski gear from their cars to the slopes and the first to refer to their customers as ‘guests,’ similar to hotels. The Deer Valley Ski Resort also has a state licensed child-care facility on site and much more. In the 2002 Winter Olympics, the resort was venue site for the freestyle moguls, alpine and aerial slalom events. It also hosts various other competitions for the International Ski Federation on a regular basis. The base altitude is 6,570 feet (2,000m), while the altitude in the mid-mountain area is 8,100 feet (2,468m) and the Empire summit is 9,570 feet (2,916m). Accessing Deer Valley Resort is easy. All visitors have to do when they arrive at the Salt Lake City International Airport is rent a car or hop in a shuttle to get to Deer Valley, which is 36 miles away via the interstate highways. The two famous slopes at the Deer Valley Ski Resort are without a doubt, Lady Morgan, accessed via Lady Morgan Express and Flagstaff Mountain, which is serviced by four high-speed quads and a triple chair. The two slopes are ideal spots for families since they offer beginner, intermediate and advanced trails that meet back at the chairlifts. The Deer Valley Ski Resort’s winter season is between December and April. The resort also offers an award-winning ski school where beginners can go to learn how to ski before hitting the slopes, and three ski rental shops where visitors can rent the equipment they need during their stay at the Deer Valley Ski Resort. The resort has much to offer in children’s adventure, including education programs on the local wildlife and environment so that children can have a learning experience along with enjoying the various activities that have been set up for children. Although there are some large ski resorts in the area, the Deer Valley Ski Resort caters to an upscale crowd and has much more to offer such as free parking shuttles, free ski valets and fine dining, lodging, and shopping options at the main lodge. To enjoy post-skiing drinks with friends, visitors will find the Troll Hallen Lounge at the Stein Eriksen Lodge to be quite entertaining. The lodge boasts of around 10,000 bottles of wine in their cellar, so it’s a good place to start if you want to enjoy fine wine. The Brass Tag restaurant is located in the Lodges at Deer Valley, featuring Deer Valley-inspired brick oven cuisine and a full bar with lots of beer and wine options available. The Royal Street Café located at Silver Lake Lodge serves delicious drinks and appetizers until 5:30 pm. For those who like to spend a nice quiet evening, that’s the place to be. The Snow Park Lodge in the base area serves until 6 pm. Other options include Buvez bar in The Chateaux on the lobby level. But, be prepared to eat something to get a drink. Visitors can stop by the Legends Bar and Grill at the base of the resort in Legacy Lodge for some after-skiing fun with friends and family. The Corner Store Pub and Grill also offers a great local feeling and offers one of the best tastings après ski drink you’ll taste during your stay at the Deer Valley Ski Resort. Nastar is the largest recreational ski program organized in the world. It was organized by SKI magazine in the 60s and is now managed by the US ski team. Those who want to join in on the excitement can take part in NASTAR ski racing at Deer Valley Ski Resort at its official race course located on Bald Mountain not far from Silver Lake Lodge. You can take an exciting ski tour of Deer Valley Resort with a friendly Mountain host every day. Up to four complimentary Mountain Host tours are organized each day and allow guests to learn more about the history of the resort and the terrain. Complimentary tours depart from Silver Lake lodges and Snow Park. Reservations are required, and only skiers of advanced or intermediate skiing abilities are allowed to take part in the complimentary tours. Put your skiing skills to the test at the Rossignol High-Performance Test Center located at the side of Empire Canyon Lodge. Take a guided snowshoe family tour with a friendly and professional guide and enjoy delicious s’mores with the family. The groomed trails will be fun for all ages. Enjoy the awe-inspiring views, campfire and the ultimate in winter adventure the Deer Valley Ski Resort has to offer. You can challenge yourself on the very runs skied by Olympians during the 2002 Salt Lake Olympic Winter Games, or experience the exhilaration of snowmobiling with a guided tour. With 7,000 acres to explore, there’s plenty of adventure for the whole family. The Deer Valley Ski Resort is known for having something to offer for everyone, including small children. Here, you will find that there’s an abundance of children’s activities they can take part in. From specialized kid-friendly skiing programs, child care programs and summer adventure camps, parents get to have peace of mind knowing their children are also having the time of their lives. Small children who are eager to learn how to ski can take advantage of the one-on-one instruction mode offered with the Fawn Special. Here, children can learn the fundamentals of skiing and enjoy a magic carpet ride that’s extremely fun and entertaining. There are also various indoor activities that children can take part in as well. 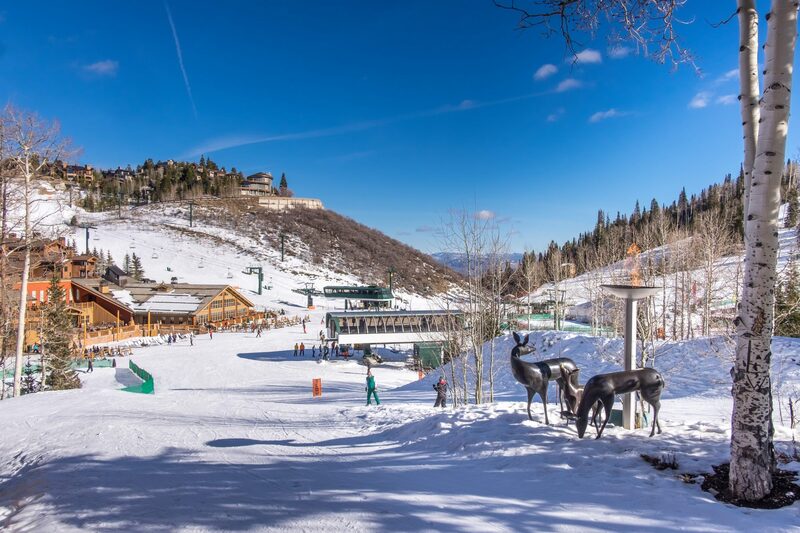 The Deer Valley Ski Resort has set its own standard for instruction to children, ensuring that children receive the best of care while their parents are away enjoying the slopes. From participating in art projects at the Children’s Center or taking one of the Adventure Trails with designated mascots, the resort caters to children in the best possible way so that they can make lasting memories of their trip to the Deer Valley Ski Resort. At Deer Valley, outdoor non-ski events are few and far between, but they do happen. The Snow Park Outdoor Amphitheater is home to many outdoor concerts and events. Here, you’ll get to catch the Utah Symphony's Deer Valley Music Festival, Bright Nights Outdoor Concert Series and the Grand Valley Bank Community Concert Series amongst others. Visitors should always phone Deer Valley helpdesk to ask for information on the events and to book their tickets in advance.